Red Harvest are a band from Norway that plays a mixture of industrial, electronic and black metal and this is a review of their 1996 album "Hybreed" which was re-issued in 2016 by Cold Dark Matter Records while the second disc is a live recording from the current year. Distorted drones start off the album before going into a heavier industrial metal direction along with some atmospheric sounds in the background and the vocals are very aggressive screams and they also mix in elements of the more underground style of electronic music and tribal style beats are also used at times. All of the musical instruments have a very powerful sound to them and some songs also bring in a small amount of goth style clean singing and clean guitars can also be heard in certain sections of the recording and you can also hear a heavy Neurosis influence in the tracks and a great portion of the songs are very long and epic in length. Throughout the recording you can hear a great mixture of slow, mid paced and fast parts and at times the riffs can get very melodic and some of the tracks are all instrumental and has an experimental and avant garde vibe to it and some songs also bring in post punk style vocals and elements of ambient and tribal music are introduced on the live tracks while also adding in some black metal screams which was a huge part of their more current material and there is also a brief use of blast beats and tremolo picking which also adds in a touch of the second wave style. Red Harvest on the first disc have a style that is more rooted in the industrial metal sound of the 90's while also having a more underground and experimental approach to t he second genre while the second disc has a bit of the same style while also getting more extreme and adding in elements of black metal, the production sounds very professional while the lyrics cover apocalypse, technology and hate themes. 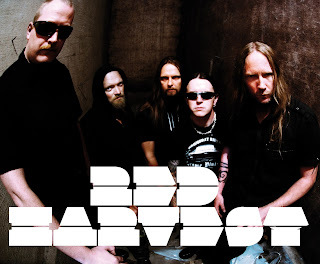 In my opinion Red Harvest are a very great sounding electro industrial metal band with elements of black metal and if you are a fan of those musical genres, you should check out this band. RECOMMENDED TRACKS INCLUDE "Mutant" "The Harder they Fall" "Hole In Me" and "Absolut Dunkel-Heit". 8 out of 10.